In Q4, smartphones continued to chip away at desktop paid search contribution in the US. The share of ad spend that went to smartphones rose nearly 5 percent from Q4 2013 to account for more than 40 percent of total search spend. That comes from Marin Software’s Benchmark Report for Q4 2014. Desktop’s share of influence fell across the board. Desktop impression share was down by 6.3 percent, click share fell by 6.9 percent, share of spend was off by 6.1 percent and conversion share fell by 10.1 percent. In contrast, smartphone ad impression share rose 4.8 percent, clicks share was up 5.5 percent and ad spend share increased 4.8 percent. Conversion share from smartphones jumped 9.6 percent. 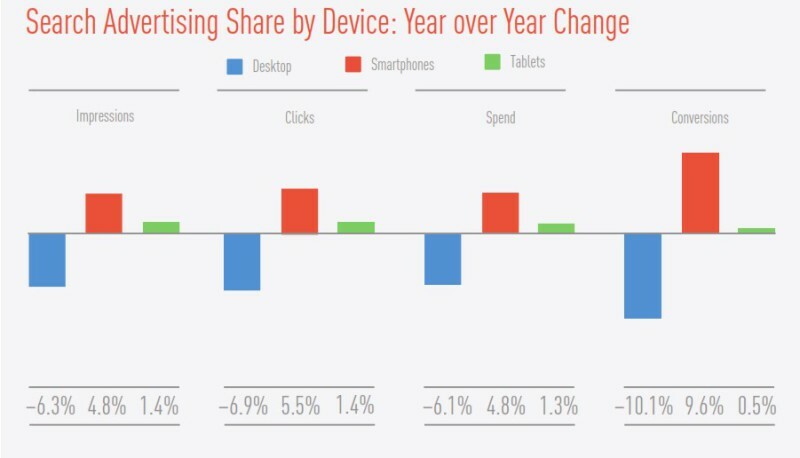 Tablets made marginal gains: impression and click share each increased 1.4 percent, spend share rose 1.3 percent and conversion share ticked up just 0.5 percent. Despite these gains, desktop still holds the lion’s share of impressions, clicks and conversions. The gap is closing in ad spend, however. 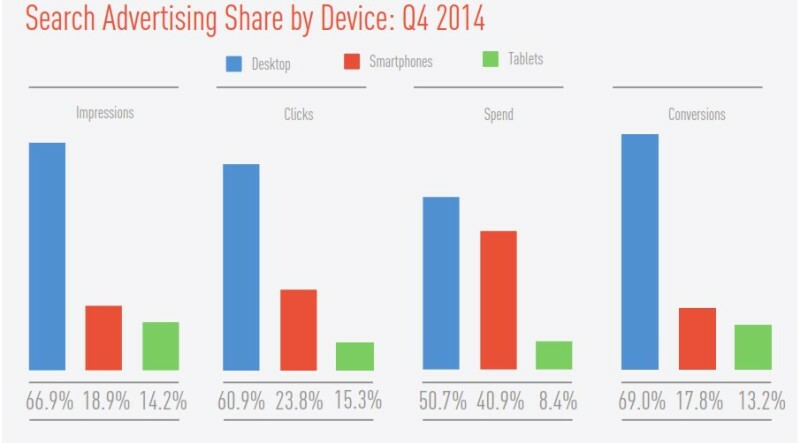 Smartphones accounted for 40.9 percent of search ad spend in Q4, compared to 50.7 percent for desktops. Tablets made up the remaining 8.4 percent. Click-through rates continue to be highest on smartphones where fewer ads display in the search results. Smartphone CTR was 2.9 percent compared to 2.5 percent on tablets and 2.1 percent on desktops. But, not surprisingly, conversion rates are still highest on desktops. Conversion rates on desktop were 10.1 percent, compared to 7.7 percent on tablets and 6.6 percent on smartphones. As mobile spend increases, cross-device and mobile attribution will continue to be a pressure point for many marketers. As the report highlights, mobile clicks can translate to in-store visits, phone calls, or later desktop conversions. Understanding how those actions translate to revenue while also trying to improve smartphone conversion rates remains a challenge. Cost-per-click on smartphones were 30 percent lower than desktop. Tablets were discounted just 9 percent from desktop. The study is based on a sampling of customers running campaigns on the Marin platform. The sample consists primarily of enterprise-level advertisers and agencies spending over $1 million on search, social and display campaigns. Copyright @ 2018 - Online Net Soft.